Yummy gummy bears! A classic, a favourite, now available with a vegan friendly recipe. You might go a lil' nutty over them! They're organic, vegan, Kosher, non-GMO and made in Canada. 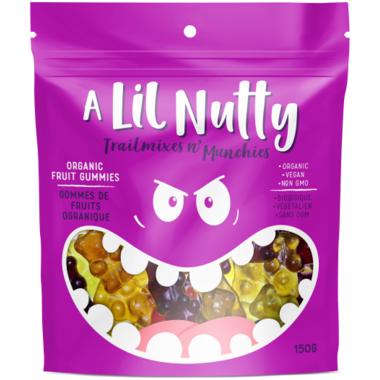 These are good but not the same texture as the typical gummy bear. It's more like purÃ©ed fruit that's been dehydrated in bear forms, they're almost gritty, but it's just a texture from using real fruit. They're ok.